Spending six figures on Falcon Wing doors doesn't look so silly any more does it? Smirk all you want at the driver piloting (or being piloted by) a Tesla Model X, but the truth of the matter is that their six-figures went towards quite a bit more than Falcon Wing doors and an ability to smugly assert they’re saving the environment with every mile they drive. That's because, provided the Model X is a P100D model, their heavy SUV that slightly resembles a whale could possibly beat a Lamborghini Aventador SV in the quarter mile and be the quickest stock SUV in the quarter mile. That’s no laughing matter. With a 6.5-liter naturally-aspirated V12 engine sending740 horsepower to all four wheels, the Aventador has everything a quintessential supercar must have and should not lose to an SUV, especially one that looks like this. But even with such ferocity, the Tesla makes winning look easy. If straight line performance is the most important selling point, then the Model S makes the Aventador SV’s half-million dollar asking price look absurd. Of course the party responsible for the video is none other than the Drag Times YouTube Channel, which has consistently proven that Teslas are formidable quarter mile champions. 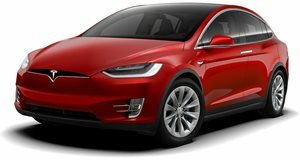 Even with a 73% charge, the Model X wins by 0.05 of a second, setting a record for fastest SUV to do a quarter mile with a time of 11.418 seconds at 117.95 mph. Next up is a Model S P100D, which ends up losing by a small margin. Despite the time discrepancy, there’s no arguing over which car sounds better.